Hannah Kim hits a putt. Kim will look to propel NU to a national championship in Oklahoma. In the past three years, Northwestern has consistently improved upon its finishes at the National Championships, racking up the three best finishes in program history. If they pull it off again, the Wildcats will be the 2018 National Champions. NU finished as national runners-up in 2017, falling 3-1-1 to Arizona State in the final of the match play bracket. In 2016, the Cats finished ninth; in 2015, they came in 10th. The Cats are returning four of their five golfers from last year’s near-championship squad, with seniors Hannah Kim and Sarah Cho and juniors Stephanie Lau and Janet Mao all returning. Meanwhile, sophomore Brooke Riley will step into now-graduated Kacie Komoto’s spot. 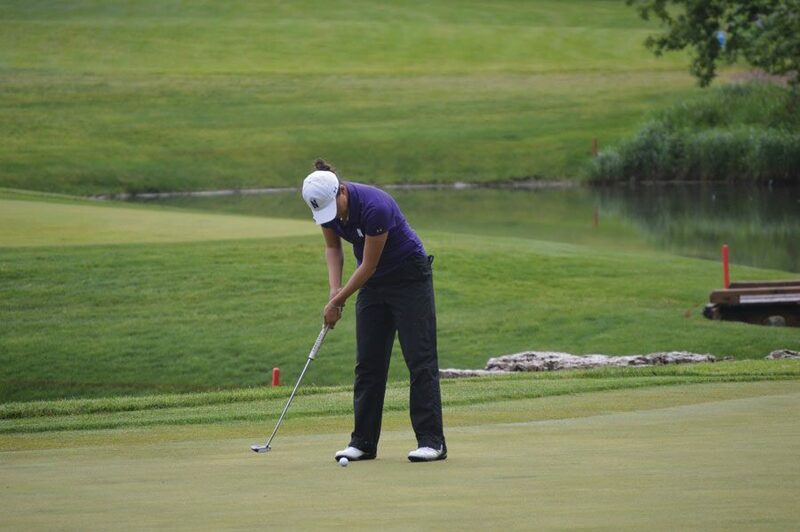 Riley has already proved herself by finishing fourth in the team’s regional event and dropping a sparkling 6-under final round to secure the Cats’ qualification at the national event. Kim and Cho will close historic collegiate careers as they play in their fourth straight National Championships. The duo has been part of every record-setting squad at NU. After they both finished outside the top 50 their freshman year, both Kim and Cho played crucial roles in last year’s second-place run. Kim went shot-for-shot with individual champion Monica Vaughn in the final, while Cho picked up wins in the quarterfinals and semifinals to help propel the Cats into that final match. It won’t be exactly the same as last year’s run, however, as the 2017 Championships were held just a short drive away in Sugar Grove, Illinois. This year, NU will fly out to Stillwater, Oklahoma, and face a course none of the players or coaches had seen before Thursday’s practice round. While the course may be new, the competition certainly won’t be. NU’s three match play opponents from last year — Kent State, Southern California and Arizona State — will all be back, as will perennial powers Alabama, Duke, Stanford and Big Ten rival Ohio State. The Cats aren’t the only ones returning championship-caliber talent, either, as the Sun Devils will bring back three of the five starters from their National Championship squad. Even with all the intensity and pressure, Cho and the squad are still having fun.